The challenges faced by society today are placing new demands upon a new generation of leaders for whom global responsibility will not be a rhetorical phrase but will be an active ingredient in all they do. 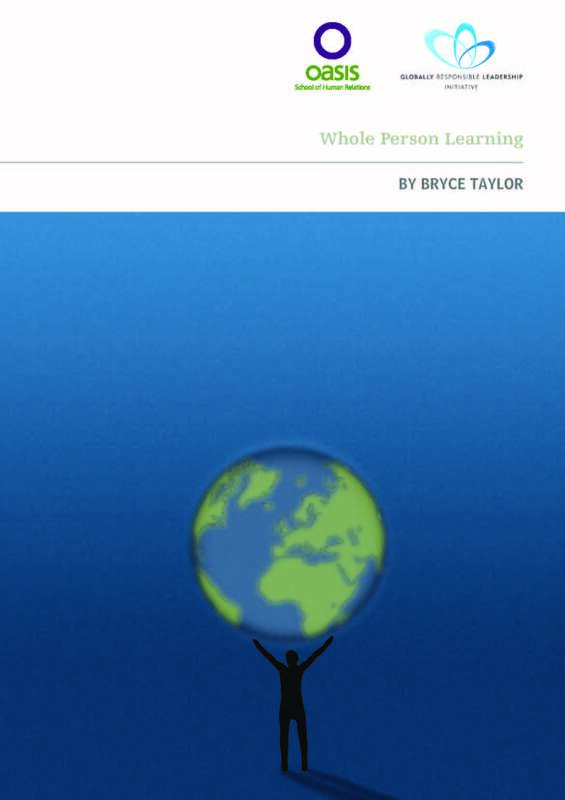 Whole Person Learning describes one approach for moving forward into the new paradigm of leadership and practice. The manual addresses the issues of globally responsible practice, leadership and practice in organisations; the purpose and value of Whole Person Learning in the world of business and management; the Whole Person Learning perspective; initiating Whole Person Learning; and the role of the facilitator in Whole Person Learning. It is an introductory tool for those who are interested in this new way of being, especially in the worlds of education and management, and is supported by a wide network of people throughout the world (largely through the work of the Globally Responsible Leadership Initiative, which sponsored the publication). Find out more about our ongoing research into Whole Person Learning. Whole Person Learning addresses issues of globally responsible practice, leadership and practice in organisations; the value of this new paradigm in the business world and the Whole Person Learning perspective. Peer learning is a radical new paradigm in the world that brings with it a call to a more enlightened educational practice. Whole Person Learning is a radical and innovative approach to relationships. Learning for Tomorrow highlights the need for such a new paradigm and explores the implications of a Whole Person perspective. Highlighting the necessity for connecting with each other in ways that make a difference – ways that allow the soul to flourish – exploring effective oneness, moving from ‘I’ to ‘we’ and the global dimension. Drawing together the voices of participants on an 18-month co-operative inquiry into holistic practice and integrated learning. Introducing the basis of qualitative research, the educational approach of Oasis and forms of experiential and new paradigm research, particularly Co-operative Inquiry.